Evergreen tree, native to Australia, flowering from a young age during winter and early spring with yellow globose flower heads (0.5-1 cm wide) arranged in racemes to about 10 cm long. The flowers are followed by 4-10 cm long, purple-brown to black seed pods. Feathery, silver-grey, bi-pinnately compound leaves. Unfortunately, Acacia baileyana is considered a weed in parts of Australia. Prefers a sunny position in any well-draining soil. Tolerates extended drought periods and moderate frosts (to about -7 degC). Ok for coastal gardens. Acacia baileyana looks magnificent when in flower; completely smothered by bright yellow flowers. Small deciduous tree with deeply cut, bright burgundy-red new leaves, turning crimson-orange in autumn. Initially this tree is vase-shaped, but with age the canopy becomes more rounded. The name means "big red bamboo', referring to the bamboo-like foliage. Prefers well-draining, rich soil in a reasonably sheltered spot. 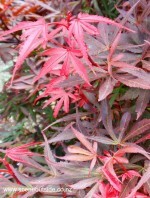 Best grown in filtered sunlight, but is more tolerant of full sun than many other Japanese maples. Drought-tolerant once established. Frost-hardy. Perfect for the smaller garden and fits in beautifully with an oriental theme. Deciduous tree with a rounded-oval, high canopy. Large, typical maple leaves, deeply lobed, green with broad, creamy white margins, turning golden in autumn. Inconspicuous yellow-green flowers in clusters during early spring before the leaves emerge. Prefers a sunny or partially shady position in any fertile, well-draining soil. Foliage colour intensity is reduced in shade. Benefits from fertiliser application in spring. Tolerates air pollution. No pruning required other than the removal of dead, damaged, and crossing branches. Also cut out any branches with leaves that have reverted to green and lost the variegation. Stressed Acer platanoides 'Drummondii' may suffer from leaf scorch with the leaves, particularly the tips and margins turning brown and subsequently shriveling. Stress results from any growing conditions that cause the leaves to loose water faster than the roots can take it up, such as drying winds, water-logging, drought, and heat. The tree will generally recover in the next season with healthy foliage. Striking specimen or shade tree with relatively coarse textured and highly ornamental foliage, combining well with other greens. For a very strong contrast, plant this in combination with burgundy-red leafed trees, but be careful not to overdo this combination as it may overpower the rest of your garden. Even a single tree can be quite a dominant feature. Acer platanoides 'Drummondii' produces vigorous surface roots, so plant away from hard surfaces, and underplant with e.g. Liriope muscari or other ground covers (not lawn) that can handle the dry and shady conditions beneath the tree. Deciduous tree with an oval to pyramidal canopy and variegated foliage. The palmately lobed, green and cream leaves with toothed margins, are heavily flecked with salmon pink or sometimes entirely orange-pink. The undersides become progressively darker during the season, turning burgundy during summer. The orange shades on the upper surface of the foliage gradually change to cream (see photo in the gallery of leaves in autumn). Inconspicuous flowers in spring. Sycamore maple cultivar, developed from a chance seedling discovered in a garden in the Esk Valley, New Zealand. 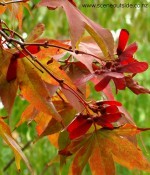 Also known (outside New Zealand) as Acer pseudoplatanus 'Eskimo Sunset'. Prefers a position in well-draining soil and partial shade. Leaf colourings vary with the amount of sun exposure, but to prevent leaf-burn, it is best to find a spot where the tree is protected from hot afternoon sun. Likes an even moisture level. Prune for shape if required in summer after leaves have fully developed. Tolerates urban pollution. Frost hardy. Stunning maple with exquisite foliage colours, perfect as an accent tree. Particularly attractive when the leaves move in a light breeze and the darker coloured undersides are visible intermittently. The canopy is generally quite close to the ground (about 1.5 m clearance), so plant it away from circulation routes. Broad-headed, deciduous tree, native to West- and East Asia, from Iran to Japan. Fern-like, bipinnately compound leaves. Fragrant, pink, 4 cm long, pom-pom-like flowers in summer, followed by flat seed-pods (10-15 cm long). Albizia julibrissin is widely grown as an ornamental tree, but has become invasive in some parts of the world. Once established, it is difficult to eradicate due to its ability to re-sprout readily and the longevity of its seed. Prefers a sunny position in well-draining soil. Tolerates moderate frosts (zones 8-12), and a wide range of soils, including sand and clay. Prone to Fusarium wilt, a fatal fungal disease. Reasonably wind-hardy and drought-tolerant once established. Albizia julibrissin with its relatively flat umbrella-shaped crown and delicate, deciduous foliage, is a graceful tree suitable as a shade tree, and perfect for flower display in summer. Since the flowers are positioned above the foliage, the tree would suit a spot where you can look down on the canopy. Evergreen tree in the dogwood family (Cornaceae), native to the Himalayas. Dull green, ovate to lanceolate leaves with grey-green undersides, 8-12 cm long, arranged in opposite pairs. Some of the leaves may turn reddish in autumn. In areas with cold winters, Cornus capitata may behave as a deciduous or semi-deciduous tree. Flowers in late spring or early summer with insignificant central clusters, surrounded by four showy, creamy white to pale yellow bracts, 7-14 cm wide. Flowers are followed by bird-attracting, strawberry-like berries, about 3-5 cm wide. Fruit may be bitter, but is edible and can be eaten raw or cooked, or used in preserves. Naturalised in parts of Australia and new Zealand, and regarded as an environmental weed in some of these areas. Synonyms: Benthamida capitata, Benthamia capitata, Benthamida fragifera, Benthamia fragifera, Dendrobenthamia capitata. Prefers a sheltered, sunny or partially shaded position in well-draining, sandy soil, but can cope with other soil types, including clay soils. Likes moist conditions, but tolerates drought. Moderately frost-hardy (-5 to -10oC). Lovely ornamental tree for flower and fruit display. The perfect tree to attract birds in your garden. Deciduous tree in the Rosaceae family, probably originating from to South-west Asia, and cultivated in the Mediterranean region for thousands of years. Dull green, oval to elliptical leaves, 5-11 cm long, covered with very fine hairs. Foliage turns yellow in autumn. 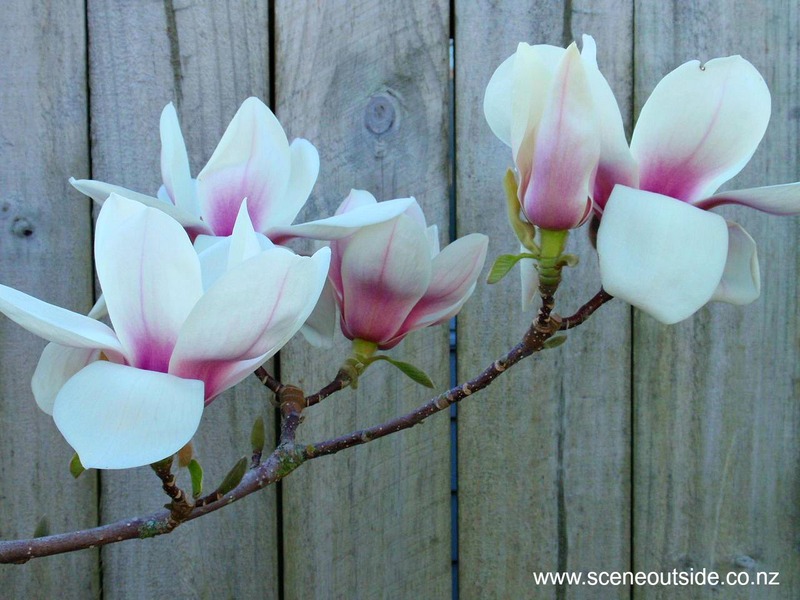 Flowers in spring with 5 cm wide blossoms, white and usually flushed with pink, emerging from pink flower buds in spring. Round or pear-shaped, fragrant, 9-13 cm long fruits, ripening to golden yellow in autumn. Quinces are used, among other things, to make jellies, jams, puddings, wine and cider. A number of improved cultivars have been developed, including 'Van Deman', 'Smyrna', 'Vrajna' and 'Champion', differing in growth habit, leaf size, fruit production, fruit shape, and hardiness. Cydonia oblonga has a long history in the Middle East, and was also revered by the ancient Greeks and Romans. The 'Apple of Discord' Paris gave to Aphrodite when he was asked by Zeus to select the most beautiful woman, was a quince. He chose Aphrodite because she offered him in return the love of the most beautiful woman on earth, Helen of Sparta. Prefers full sun and light soils. Tolerates most soil types as long as they are well-draining. Copes with less than all-day sun, but doesn't fruit well in a shady position. Requires a cold period (like apple trees, but shorter) to encourage flowering, and a warm summer for the fruits to ripen. Protect from strong winds. Self-fertile, so you only need one tree for fruit production. Prune in winter to open up the center of the tree, and train to a central leader with secondary leaders fanning out. Without pruning and training, Cydonia oblonga tends to form an irregular tree with somewhat crooked branches from quite low to the ground. Frost hardy (zone 6). An interesting specimen tree with gorgeous spring blossoms, and unusual, bright (but not glossy) yellow fruits weighing down the branches in autumn. For a lovely colour combination later in the growing season, plant Cydonia oblonga near shrubs with deep purple flowers in late summer and autumn, such as Salvia 'Black Knight', or blue flowers, such as Dichroa versicolor. 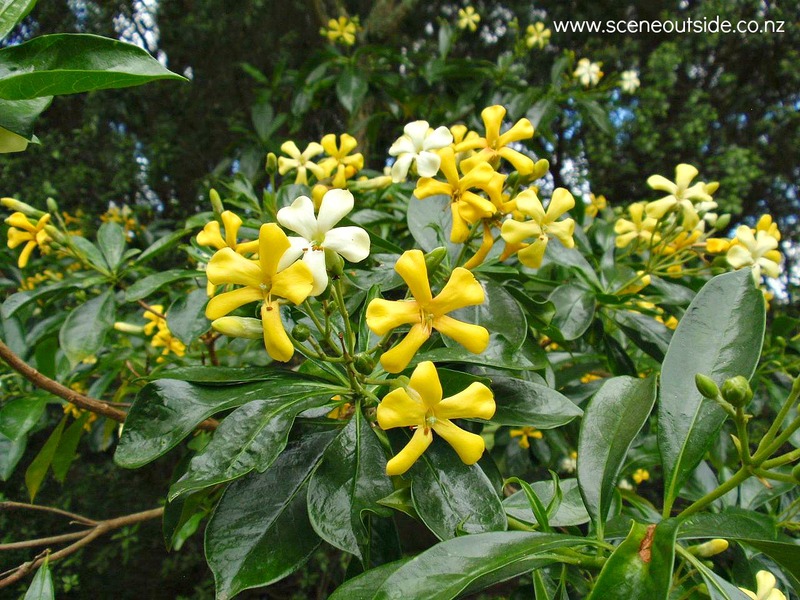 Variable, evergreen shrub or small tree, occurring naturally in coastal and lowland forests throughout the North Island, the northern part of the South Island of New Zealand, and the Chatham Islands. Also found in southern Africa, tropical America, the Pacific Islands, and throughout Australia. Alternate, linear to lanceolate, pale to mid-green, sticky leaves, 4-10 cm long and 1-3 cm wide. Tiny creamy yellow, usually unisexual flowers in spring, with male and female flowers borne mostly on separate trees. In summer, female flowers are followed by conspicuous, 1-2 cm wide, winged seed capsules. These capsules are pale yellow, gradually turning reddish brown, starting from the edges of the wings. Attractive red-brown bark, peeling in stringy flakes. Very tough wood, black with white streaks. Prefers a sunny or semi-shaded position in well-draining soil. Tends to become leggy when light levels are too low. Tolerates light to moderate frosts (zone 9), coastal conditions, dry soils, and strong winds. Does not tolerate wet soils. Prune regularly and lightly to keep compact. Responds to trimming for hedging purposes. Versatile, fast-growing plant. Dodonaea viscosa can be grown as a specimen tree by gradually removing the lower branches, showing off the bark and developing an interesting, irregular crown, shaped by the wind in exposed situations. Although predominantly used as a foliage plant, a tree laden with seed capsules is a sight to behold. Excellent choice for a hedge, in particular in coastal areas, and when alternated with other hedging plants. Also makes a good filler or backdrop for lower-growing shrubs with different textures and/or foliage colours.